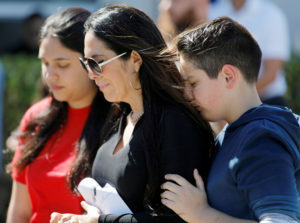 Seventeen people were killed Wednesday when a former student at Marjory Stoneman Douglas High School in Parkland, Florida, opened fire on the building. They included the school’s athletic director, an ROTC student and a geography teacher who blocked a door to keep students safe, according to the Associated Press. The suspect, 19-year-old Nikolas Cruz, confessed Thursday to shooting students and staff, according to a report from the Broward County Sheriff’s Office. Cruz was charged with 17 counts of murder earlier today. Multiple vigils are planned in Broward County and Palm Beach County, Florida, on Thursday evening. Here is a full list of victims released by Broward County’s Sheriff’s Office.